An audiovisual design and management consultant offers six takeaways from the biggest AV trade show of the year. InfoComm 2017 proved to be another record-setting show, with over 44,000 audiovisual and IT professionals converging in Orlando this June. Higher education AV technology managers and design/support staff made a very strong showing, with quite a few IT staff also attending to sort out these new AV support duties they've been tasked with. While there weren't any blockbuster product announcements, the overall feeling of the show was that of an industry that's healthy and growing. Due to my background in higher ed AV design and support roles, I walked the show floor looking through the lens of a higher ed technology manager. I also spent some time visiting manufacturer's booths with Ryan Engels from Ithaca College, so I could experience the perspective of a forward-thinking higher ed technology manager. Most of his show experience was focused on developing his networked, centrally managed AV model, often diving deeper into how a manufacturer's piece of equipment will integrate with his existing campus enterprise network and how he will properly manage it after installation. I also taught a couple seminars that attracted higher ed AV professionals, and the Q&A sessions there proved to be useful in hearing where their focus is these days. My topics of ADA classroom design and construction project management garnered a lot of interest. Following are six areas that got my attention on the show floor. From the higher ed AV perspective, AV-over-IP was the most prevalent theme throughout the show, with major players like Crestron, Kramer and AMX (SVSi) showcasing their encoder/decoder offerings and quite a few midsize and smaller companies doing the same. The presence of the SDVoE (Software Defined Video Over Ethernet) Alliance shows that some manufacturers are serious about developing AV-over-IP hardware and methods with future standards and interoperability in mind. The debate of latency, bandwidth usage and video compression rages on, suggesting that this technology is still on an upward swing of development. Laser offerings were king of the projector market this year. 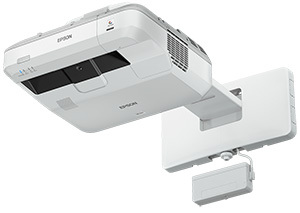 Epson's BrightLink series has proved to be a solid player in the ultra-short-throw interactive projector market, so the company's new 710Ui short-throw 4,000-lumen interactive laser projector will be a go-to model for many classroom designs in the near future. Flat-panel displays are surely replacing projectors in small to midsize classrooms and meeting spaces, but manufacturers continue to offer higher lumen laser projectors, making them a viable option for your larger lecture hall and theater spaces. I still stand by my opinion that classroom image sizes over 80 inches will usually fall into projection-based designs. Typically a market that has been a bit stale for the past few years, audio brought some interesting products and trends to the table for 2017. Dante is still getting bigger and better with widespread adoption. Audio companies are going through the same digital transition that video switching went through when VGA connectors and HDMI connectors were still needed everywhere. DSPs are packed full of analog I/O connectors, Dante jacks, VoIP/POTS jacks, USB outputs, proprietary interconnect ports, logic connections and RS-232/IP control options. Pay attention to not only the DSP options you need right now, but the options you may need in the near future. A small upgrade cost now for a model with Dante or VoIP support will save you the money and headache of having to swap out the whole box in a year or two. I also set out this show to investigate some cost-effective, feature-rich audio processing options for smaller classrooms and meeting spaces. Installing a full-blown 12x8 DSP in these spaces to handle a couple installed web conferencing microphones isn't a very cost-effective model. I find that many designers neglect the importance of proper microphone processing when installing web-based conferencing systems. A basic fixed USB camera may be enough to handle the video side of things, but poor audio will ruin a conferencing system. Ceiling, table and wireless mics are still needed in the midsize/larger rooms. I was looking for smaller boxes that would still provide basic DSP functions, AEC, Dante support, USB output and auto mixing. Shure, Audio-Technica, and Biamp all caught my eye with some viable options. Shure showcased its P300, which is a cost-effective DSP mainly built to provide processing for the company's Microflex Advance Dante ceiling and table mic array units. Audio-Technica introduced its ATDM-0604 Digital SmartMixer, which is an auto mixer with echo cancellation that seems like a cheaper alternative to a full-blown DSP. Biamp added to its popular TesiraForte line of DSPs with a smaller VT4 model, with is a 4x4 model with the same features we know from previous TesiraForte experience. For those involved in higher end video production in classrooms and campus event spaces, Vaddio introduced the AV Bridge Matrix Mix. This rack-mounted box offers production-quality video switching and routing, with a built-in AV Bridge USB 3.0 output for web conferencing/streaming integration. While there may be quite a few video production switchers on the market, I took notice of this box because of the potential for it to be installed in a large classroom to pull double duty as a production switcher operated by production staff, or in a more automated design operated by an instructor for basic classroom web conferencing, lecture capture or distance learning applications. This box can be controlled via a web interface, a separate and familiar production-style camera switcher/controller interface from Vaddio, or connected to a third-party control system for a standard classroom touchpanel scenario. Corporate and commercial AV seems to be booming right now with creative digital signage solutions. While this may not directly relate to the basic digital signage applications typically seen on higher ed campuses, it made me start longing for more creative digital signage to start making its way into our corner of the industry. Direct view, fine-pitch LED video wall panels were everywhere — and looked stunning. Manufacturers are also offering odd aspect ratio flat-panel displays made for applications like wayfinding and menu board signage. Pay attention to creative content creation and you'll have a very unique digital signage scenario on your campus. I'm always on the lookout for parts and pieces that can clean up my AV system designs and installations. It seems that everyone wants AV systems packed with features, but flexible furniture and room aesthetics requirements dictate that we need to find creative ways to hide our equipment without sacrificing serviceability. I took notice of three companies offering new creative solutions to equipment and cable management: Middle Atlantic, Chief and FSR. Middle Atlantic's Proximity Series offers some solutions to hiding equipment behind flat panel displays. The company's in-wall boxes behind displays offer a landing place for power/data connections as well as cable path, but they also contain a flexible mounting plate/bracket system for stashing all of those extenders, small boxes and media players. Middle Atlantic also was showing a flat plate that mounts to the wall behind a display on sliding rails, allowing small equipment to be secured to this plate and easily slide out from behind the display in servicing situations. Chief debuted its PAC527 in-wall box behind displays, expanding on the company's existing PAC line with an increased size and a flexible and configurable number of mounting brackets for small AV boxes. Hopefully we will see this flexible bracket mounting solution in a future redesign of Chief's PAC525 and 526 boxes. FSR is showing the PWB-320, which is a similar flat-panel display in-wall box at a reasonable price point. FSR also highlighted its PWB-HVBX in-wall box that mounts behind a flat panel display. A finished portion of the box is exposed below the display, and contains a couple cable retractors plus space for storage of small AV boxes, power/data and cable path. If you're installing small huddle space displays in a flexible furniture situation where you can't rely on a table always existing below the display, look to this box to clean up your cable management. If you need to mount a couple RUs of equipment under a conference table, both Middle Atlantic and FSR have some creative under-table and table-leg (pedestal) options. I'll end this InfoComm 2017 wrap-up with a plea to the show's organizers: Please open the trade show floor for a fourth day, and possibly move more of the education opportunities to Saturday, Sunday and Monday. It's very hard to see all the booths in just three days, especially with education opportunities being offered on those same days. I know there are plenty of backend logistics that may make that hard, but I just never leave the show feeling like I saw all the booths I wanted to see, or attended all the classes/seminars that I hoped to. With another record-setting year of attendance, it seems like the time to expand the show.